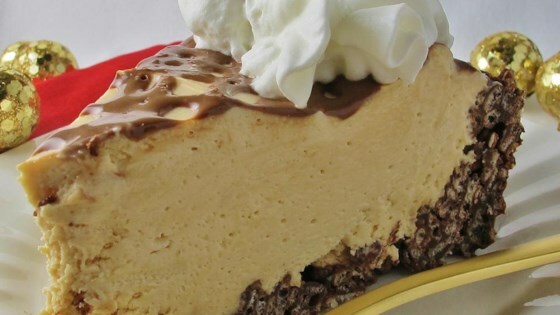 "I'm not a cheesecake fan, unlike my husband, so this was my compromise. I actually really enjoy it!" In a heavy sauce pan over low heat, melt the butter and chocolate chips. Remove from heat and gently stir in rice cereal until coated. Press into the bottom and sides of a 9 inch pie plate. Chill 30 minutes. In a large bowl, beat cream cheese until fluffy. Gradually beat in condensed milk and peanut butter until smooth. Stir in lemon juice and vanilla. Fold in whipped cream. Pour into prepared crust. Drizzle chocolate topping over pie and freeze for 4 hours or until firm. Keep in freezer until ready to serve, and return leftovers to the freezer as well. Superb! Put in a 13x9 pan and made a more bar like appearance. This served wonderfully and tasted fabulous!